The French know a few things about wine and opening it is no exception. Featuring an innovative lever effect, the Corkscrew Express™ allows you to uncork your bottles quickly and effortlessly with a single 'push down pull up' action. 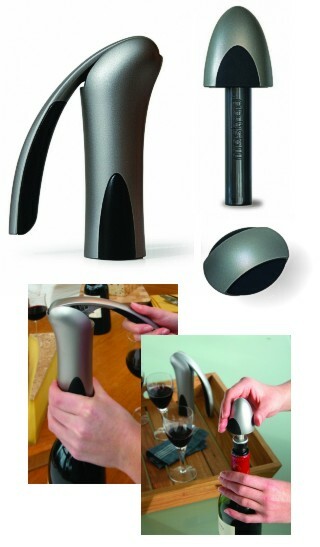 Aesthetic and ergonomic, it opens all types of bottles, including those with a wider neck and can also remove the new plastic corks. Included in the pack, the vacuum stopper enables you to keep your wine air-free, and can also be adapted to all wine bottles. Gift box also includes: foil cutter, vacuum stopper and a spare coated high carbon steel screw.